It has been a busy few weeks at Melton Mowbray Market, with full sheep and cattle sheds, interspersed with many seasonal events and some exciting corporate developments. Cattle prices this year have followed the trend of previous years, but a little earlier, with prices dropping off for summer in June rather than July. They remained steady through July and strengthened into August and September with the good weather, with prices reaching a high of [250p/kg]. There is a conundrum for many farmers here, in that good weather will spur them to harvest and keep the stock at home, but the resultant lower supply to market means that prices rise. Don't forget that the market can help you here and take your stock in and manage the sale for you so you don't miss out on the best prices. As the harvest has tailed off, prices have eased a little, but are now picking up again, with many yarded cattle drying up and the grass-fed cattle not quite ready. It is difficult to try to second guess the market, but my expectation is that more cattle will enter into the system during October which will keep a lid on prices, which will then rise again through November with the higher demand towards Christmas. In the stores, prices remain very strong and if farmers are to make money from the trade, we would hope to see increased prime prices next year. The last item which has frustrated me and many others for some time now is the 6 day rule. 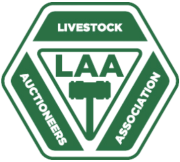 I was recently asked to judge commercial beef cattle at the famous Clogher Valley Show in Northern Ireland, staying with William Boyd, well known with the LAA and respected amongst the farming community. The 6 day standstill isn't treated the same way in Northern Ireland, although part of the United Kingdom why are rules different? At present in the rest of the UK, the 6 day standstill means no movements allowed from the entire holding, whereas in Ireland it only affects stock brought on to the holding, a far more sensible approach which allows livestock markets and their customers to have fair trade. I understand Defra are looking into this in 2018, but please bring this forward as a matter of urgency. The Welsh are starting to take action and the English market could be left behind if we are not careful.